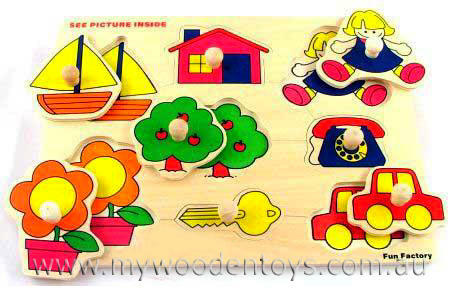 Puzzle with Knobs is a classic simple wooden puzzle which is brightly coloured and contains 8 shapes with knobs to make them easy for small fingers to grab. When you remove the shape it's corresponding picture is underneath so it's fun to match them up. This is a great starter puzzle for infants but remember as always under 3s will need supervision. Material: Wood with gloss paper wipe clean surface. We like this because: "It's very simple and inexpensive"